Wordsmith David Bayard provides an enlightening window into nature and self in his baker-dozen collection of poems, Gathering the Self. A compilation of thirteen writings that span thirty-nine years, Gathering the Self encompasses Bayard’s “poems of the heart,” or as he would put it—Pommes de Coeur: Apples of the Heart. “Tools of self-discovery and healing medicine,” which were initially used to help him “reclaim” himself, are woven into each poem. Bayard utilizes his sharp eye and fine-tuned analytical skills for woodworking and photography to look beyond self to understand self through the power of nature. His writings presented either from his viewpoint or an item of nature include an assortment of free verse, prose, rhyme scheme, (extended) limerick, cinquain, and one poem that has a haiku-ish feel to it. 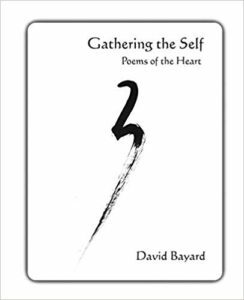 While each piece of work has the ability to stand on its own, permitting readers to meditate on Bayard’s words and embrace them in a way to raise self-awareness and enlightenment, what makes his work unique are the accompanying stories behind the poems. The stories not only add depth to the “who, what, why, where, when, and how,” but also gives readers a glimpse into the author and his personal life journey. Bayard opens with two of his older writings before entertaining his recent poems. His vulgarity-free lingo largely speaks to relatable issues while at the same time exploring. While some themes focus on personal struggles and the ability to overcome them through the healing power of the natural world, like in his opening works, “To Cherish” and “Drink Me,” others are reflections on death (“Chrysalis”) and suppressed feelings (“Who Died to Make This?”). The poems that stand out the most are the ones that are written from the point of view of items of nature since they not only capture possible thought processes, but also provide perspectives of how very small and insignificant humans are to the rest of the world. Quill says: Enlightening and thought-provoking, Gathering the Self provides poetry lovers with a fresh perspective on life.